Centre for Pakistan and Gulf Studies » CPGS proposes launch of Pakistan-EU Friendship Forum: Senator Sehar Kamran T.I. 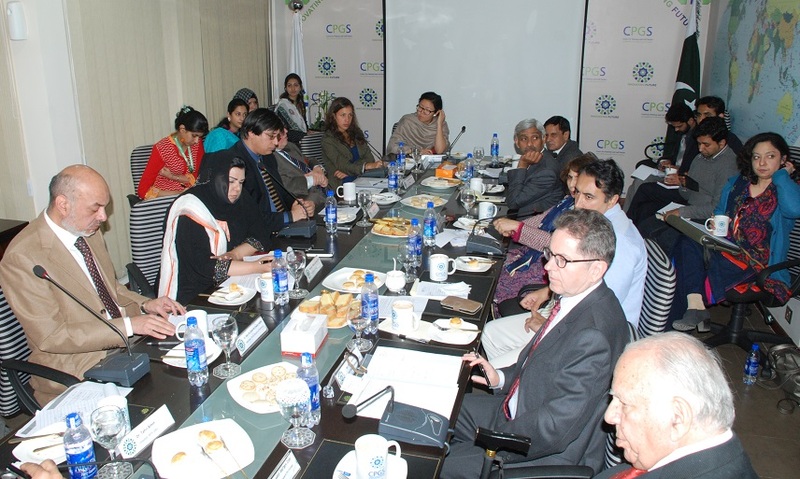 CPGS proposes launch of Pakistan-EU Friendship Forum: Senator Sehar Kamran T.I. Islamabad, February 26, 2014: CPGS will be establishing a ‘Pakistan-EU Friendship Forum’, under the able chairmanship of Former Secretary General MoFA Ambassador (R) Akram Zaki, Member CPGS Advisory Board. This was announced by President CPGS Senator Sehar Kamran (TI) during the Roundtable on Pakistan-EU Relations: Convergence and Divergence, organized by Centre for Pakistan and Gulf Studies (CPGS) on February 26th, 2014. This was the fifth in the series of such discussions conducted by the CPGS. The earlier rounds included Pakistan’s relations with the U.S., “Pakistan-Russia relation: Challenges and Prospects”, “Pakistan-Afghanistan relations: U.S. drawdown and its implications for Pakistan”, and Pakistan-China relations: Challenges and Prospects”. Besides the CPGS President, Senator Sehar Kamran and researchers of the Centre, today’s event was also attended by a large number diplomats, senior scholars and students. Prominent among the participant were Charge d’Affaires of the EU Delegation Mr Pierre Mayaudon, Mr Shahbaz Hussain Director Europe Ministry of Foreign Affairs, Akram Zaki, former foreign secretary of Pakistan, Gen. Owais, Dr. Tahir Ameen, Dr. Noman Sattar, Dr. Mansoorand Dr. Marwa Enayat. Senator Sehar Kamran emphasized the need for greater cooperation between Pakistan and EU in the fields of education, health and energy. Pointing out the discrimination against Pakistan by some members of the Nuclear Suppliers Group (NSG), Senator Sehar Kamran called upon the European Union to facilitate Pakistan’s access to NSG on equal footing with India. Senator Sehar Kamran has Strongly Condemned Sunday’s Bomb Blast near the Kohat Police Lines Killing 13 People Including Two Women and a Child, and Wounding 16, Authorities Said.